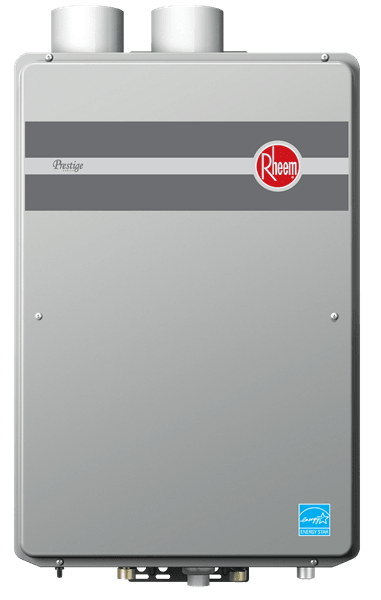 With Rheem‘s long history, a consistent track recording of receiving top ratings and awards for their products, and the honor of being the best-selling brand of water heaters in America, we are certain you will be satisfied with whichever Rheem Water Heater you choose for your family’s hot water needs. We are committed to developing hot water solutions with the perfect balance of value, performance and features for every lifestyle and budget. Tank Water Heaters provide a large volume of dependable, low-cost hot water. Fuel sources can be propane, natural gas or electricity. They are the most common way to heat water in the United States. Residential tank water heaters typically store between 20 and 80 gallons of hot water hot throughout, usually at the factory setting of 120°F. The temperature can be adjusted up or down by a control on the unit. Tank water heaters are typically located in the garage, basement or attic. Upgrading a standard 5′ x 9′ bathroom to a master suite or an in-home spa may require upgrading to a larger gallon capacity unit, especially if the new bathroom will include a deep soaking tub with a multi-head shower system. Replacing a tank water heater with another tank water heater is fast and keeps labor costs to a minimum. Tankless water heaters are today’s most popular “green” hot water solution, with the added benefit of actually enhancing the clients’ experiences in a luxury bathroom. No matter how many body sprays and showerheads, no matter how deep the whirlpool, your clients will not run out of hot water with a properly sized tankless water heating system. Tankless gas water heaters are more energy-efficient than conventional tank heaters, because they eliminate the need to maintain a large supply of pre-heated water. Tankless units provide hot water on demand at a precise temperature needed, so there is no storage and therefore no need to expend energy heating that stored water. About the size of a medicine cabinet, tankless water heaters can easily be wall-mounted indoors and even outdoors, depending on the climate. The ability to place a tankless water heater closer to the point of use solves the problem of a long wait for hot water. That problem is not solved by simply replacing a tank water heater with a tankless water heater in the same place. Delays in hot water delivery have to do with where the water heater is located, not the type of water heater. Tankless water heaters have convenient digital wall-mounted controls and even waterproof remote controls that make it easy for clients to adjust the temperature as often as they wish for convenience as well as safety. Clients might want exactly 120°F for the dishwasher, but only 106°F for the baby’s bath time, and back up to 110°F to fill the tub to precisely the preferred temperature for a relaxing soak. Solar water heaters are an even greener hot water solution that uses a dark-color solar collector to capture the solar energy. Solar water heating systems can be “passive,” where the water flows between the collection are to the storage tank via gravity or some other non-mechanical means; or “active,” which uses a circulating pump to move water through the system. An active system may also be called “forced circulation,” and requires more energy than passive systems. Even the most efficient solar water heaters sometimes require some auxiliary heating (boosting). This may be because of a large, late-in-the-day hot water usage or after a long period of extensive cloud cover. An electric, gas or other fuel-type booster can be quite effective in enabling a solar water heater to provide a year-round supply of steaming hot water, but it also obviously adds more energy requirements.